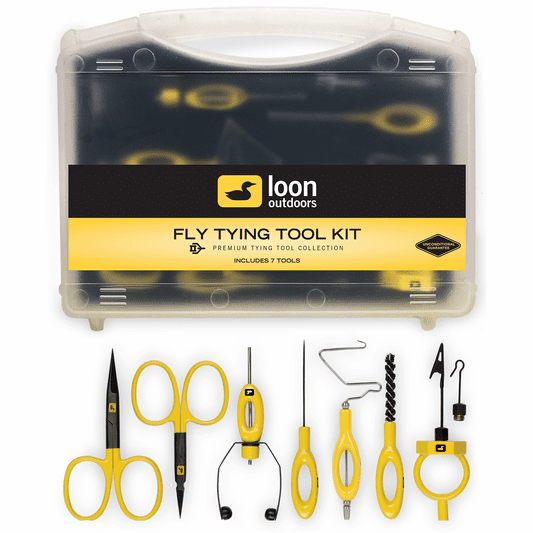 The Loon Fly Tying Tool Kit is an excellent choice for either the introductory tier or the experienced creator looking to add some quality tools to his arsenal. 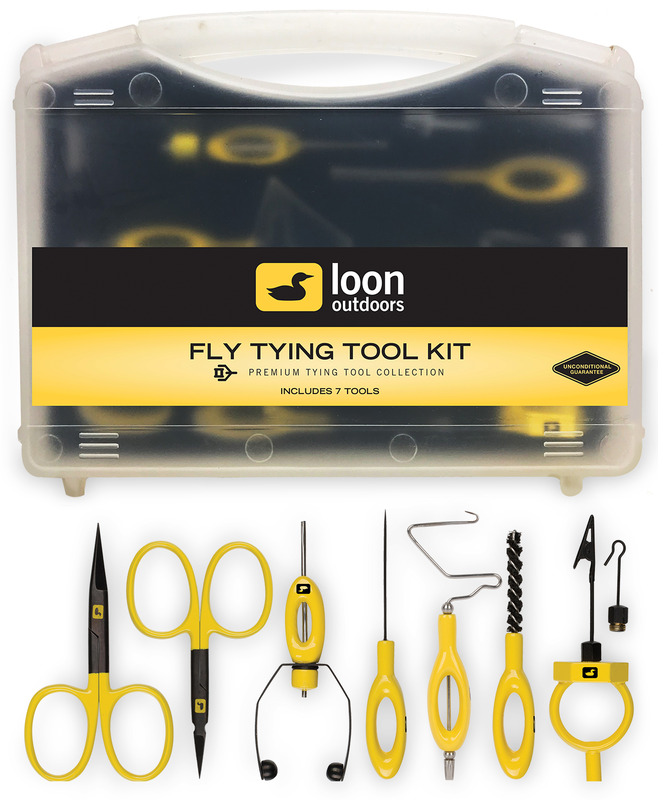 This Loon kit includes: Ergonomic Arrow Point Scissors, Ergonomic All Purpose Scissors, Ergonomic Bobbin, Ergonomic Bodkin, Ergonomic Whip Finisher, Ergonomic Dubbing Brush, and the Gator Grip Dubbing Spinner. All of these tools are top of the line and from Loon, a brand we have stood by for years and years and use at our own personal vises every single day. All of this comes in a durable plastic travel case for safe and easy transport. Arrow point Scissors: These scissors are made with surgical quality stainless steel and are 3.5 inches long. The micro tip blades are extra sharp for all applications, but flourish when precision is the standard. All Purpose Scissors: The ergonomic grips on these scissors accommodate fingers of all sizes, and the micro tip blades were designed for precise cuts in tight quarters. 4 inches long. Surgical quality stainless steel. Ergonomic Bobbin: The powder coated ergonomic handle creates the perfect, comfortable grip between your thumb and fingers so you can use it time and time again with no discomfort. The Spring Steel Spool Holder can be easily adjusted for varying tensions. The tube of the Loon Ergonomic Bobbin is versatile; the high gauge is great for when you are tying small flies, and the long-tube design makes creating large patterns easy as well. Ergonomic Bodkin: The Ergonomic shape makes this bodkin easy and comfortable to use again and again. The powder-coated grip allows you to securely grasp the bodkin for added control while tying at the vise. Ergonomic Dubbing Brush: The ergonomic handle is comfortable and easy to use, and the brush is made from nylon bristles oriented in a stainless steel helix spine so it can easily brush through any material effectively. The powder-coated handle is also easy to grip and gives you a solid grasp on the dubbing brush. Ergonomic Whip Finisher: Not only does this tool feel great in your hand and function as a trustworthy whip finisher, the base of the tool has also been sharpened so that finishing flies and clipping thread can be accomplished with this all in one product. Gator Grip: Developed in partnership with FlyFish Food, the octagonal anti-rolling design keeps the dubbing spinner from rolling around on the tying desk. The ring shape maintains smooth and consistent tension at all times while in use. This tool features both a gator-grip tip and a dubbing loop hook. The Loon Gator Grip Dubbing Spinner works well on all sizes of flies.